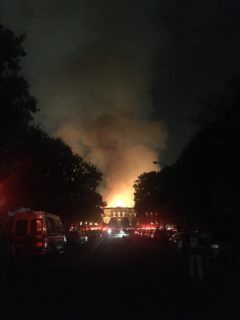 On September 2, a hot Sunday in Central Brazil, I saw the incredible images of an enormous fire rapidly consuming the National Museum of Brazil—a building that is itself protected as heritage. The building was the residence of the Portuguese royal family and was transformed into the first house of science in Brazil at the end of the nineteenth century. The fire left the vulnerable 20 million pieces—rare collections and documentary dossiers of areas of knowledge such as anthropology, archeology, geology, biology, linguistics, and biological anthropology, among others—irreparable. In spite of this, from a traumatic memory that will persist for some time, I insist on thinking about the future. The fire destroyed the exhibition rooms, archives, library, and administrative headquarters of several postgraduate courses in Brazil, including social anthropology, which is among the oldest and was awarded a standard of international excellence by Coordenação de Aperfeiçoamento de Pessoal de Nível Superior (the Brazilian postgraduate evaluation agency or CAPES). Displays and archives of insects, prehistoric fossils, thousands of documents, photographs, and ethnographic artifacts were turned into a desolate landscape. The fire also consumed the oldest human fossil ever discovered in the Americas: Luzia—dated as 12,000 years old. I have worked as an associate researcher in the Ethnology and Ethnography Department of the National Museum since 2013, studying with my students a collection of Karajá artifacts— Karajá are an indigenous group from central Brazil. The anthropologist William Lipkind, a student of Ruth Benedict and Franz Boas at Columbia University, created this collection in 1938-39; at the time he had an academic partnership with the National Museum. The fire caused the third floor, where this collection of 527 objects was housed, to collapse, destroying the Ethnology and Ethnography Department together with the valuable archive of the institution next door. This was a great loss for science, particularly for the history of Brazilian anthropology, and for Brazilian anthropology’s connections with the discipline in the United States. The W. Lipkind collection is only one part of the ethnographic collection affected by the fire. The ethnographic collections of the Ethnology and Ethnography Department consisted of two centuries’ worth of anthropological production and collaboration between researchers, curators, indigenous peoples, and other populations. The collection contained 42,000 pieces of indigenous and Afro-Brazilian origins, and still others from Africa, Oceania, and the Americas. I saw the burning building on television, and the feeling that I could not do anything brought great anguish and sadness. Brazil’s heritage collections are protected by our 1988 constitution. But little has been done to safeguard them, despite numerous appeals from the museums of federal universities, including a request for a project to safeguard our cultural heritage. This has been a hard lesson for our country. We now have a traumatic memory of the fire that destroyed part of the history of Brazil, Latin America, and humanity. The fire at the National Museum painfully pours salt on the wounds caused by the neglect of our society and the state, especially in recent years, as it drastically reduced investments in research and projects to investigate and celebrate our cultural heritage. With the devastation of the National Museum, our other museums, houses of culture, libraries, theaters, and cultural heritage die as well. However, to heal the wounds of this great disaster we must break the inertia of the inaction that made the fire possible and work for the future. The building of the National Museum is still undergoing a federal police investigation. Therefore, it is neither possible to quantify what has been lost nor to know what can be recovered—as pointed out by my colleagues at the National Museum of the Federal University of Rio de Janeiro. In spite of this, from a traumatic memory that will persist for some time, I insist on thinking about the future. Working groups comprising networks of researchers from the National Museum and other Brazilian and international institutions; postgraduate students; and representatives of indigenous populations, museums, and cultural centers have long dedicated themselves to researching anthropological history, the organization of peoples and their ways of producing and negotiating their objects—and to establishing practices of shared museology. From now on, the anthropologists of the National Museum are dedicated to building secure bases for the start of a digital rescue. For example, all my research material that had been digitally copied (photographs, documents, and research done in Brazil and the United States) will be returned to the National Museum. It should be noted that colleagues in the Ethnography and Ethnology Department had already scanned 13,000 objects from the Karajá, Guarani, and Tikuna peoples. For more information on how you can help, visit “Rio de Janeiro’s National Museum: How You Can Help” on the AAA website. Manuel Ferreira Lima Filho is director of the Anthropological Museum at the Federal University of Goiás, Brazil, and a social and cultural anthropologist and researcher with the Brazilian National Council for Scientific and Technological Development, Coordenação de Aperfeiçoamento de Pessoal de Nível Superior (CAPES), Fulbright, and Fundação de Amparo à Pesquisa do Estado do Rio de Janeiro (FAPERJ).